Lisa is all about the accessories. She's been a hair dresser and a food critic so it's not such a stretch to see how Lisa Petty ended up taking her creative style and eye for detail and landing her dream job as the style reporter for The Feast. 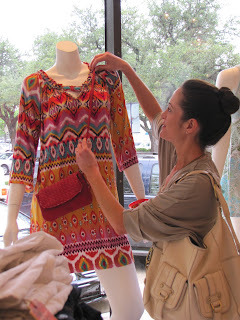 Lisa's a local fixture on the Dallas fashion scene. You'll find her front row at all the designer shows, notebook in hand, taking copious notes about the cut, style and details that she will report as tomorrow's trends for our fair city. But her life isn't all stilettos, cocktails and gowns. On any given day, you'll find this long-legged stunner wandering the small boutiques of our city's random strip malls looking for inspiration. Maybe it's a new line from an unknown designer. It could be a designer top discovered at a resale shop for mere pennies on the dollar. Maybe it's a realization that our city is being overrun by stripes. Lisa says "Fashion can be fluff, but it is also interesting. I strive for my writing to be thoughtful." Smart and beautiful. If I didn't know how truly nice she was... I would really hate her. Lisa and I hooked up for a lunch/shopping date last week so I could observe her in action. We popped into Mal Malouf's in The Plaza at Preston Center to see what was new. We both fell in love with a collection of flirty strapless party dresses, so I wasn't a bit surprised when they turned up on The Feast the next day. When Lisa's not shopping working, she's hanging out with her husband, Jeremy, and their dog, Max. But, I would imagine, that even when she's chilling out with her boys... she can't help but be people-watching. You know, just to see what you are wearing. You can read Lisa's style musings at The Feast.